The top priority of world leaders gathered at the 71st session of the United Nations General Assembly (UNGA 71), was combating global terrorism. The United Nations is a platform that can rally global and multi-lateral support, cooperation and efforts for counterterrorism. Although other topics were discussed, the critical question of the day shared by many nations was, as a global community, how could we battle terrorism? A constructive, multilateral and modern approach is needed to battle modern methods of terrorism conducted by state or non-state actors. Action needs to be taken, however the most non-productive approach would be to make accusations or play the blame game. It wastes time, incites rivalries, and only feeds the very violence that we are trying to overcome. For instance, Iran's approach of pointing fingers at everyone- except for the Iranian government, Iran's Revolutionary Guard Corps (IRGC), its staunchest ally Assad, and its proxies- is not a solution. It is a simplistic, short-sighted approach that can only lead to failure. In his UNGA speech, President Rouhani blamed the world powers for terrirosm. Such behavior strengthens animosity between countries at a time when the entire global community needs to work together to stop further bloodshed. The countries that Iran is demonizing and blaming for all acts of global or domestic terrorism are the US, the UK, and Saudi Arabia, among others. Contradicting this is the fact that each of these countries has contributed various resources in the battle against terrorism whether Iran agrees with it or not. Again, the issue is not as simplistic as the Islamic Republic attempts to project it. Let's take one country- The Kingdom- that Iran is vehemently blaming, for example. All the points and data that Crown Prince Mohammed bin Nayef gave at his speech on Wednesday at the United Nations General Assembly, are factually correct whether Iran disagrees with it or paint it differently. For example, to combat radicalism, according to Prince Mohammed bin Nayef his country "has launched Mohammed bin Nayef Counseling and Care Center and its top clerics have been issuing religious edicts prohibiting terrorism or joining terror groups. Saudi has been attacked by terrorists more than 100 times...[Riyadh] is now part of 12 international agreements to fight terrorism," and it heads in "partnership" with the United States and Italy a group combating ISIS funding. Addressing underdevelopment is crucial as well as "the kingdom ranked the third country worldwide in terms of providing humanitarian relief and development assistance, having provided over the past four decades about $139 billions in aid." According to the Carnegie Endowment for International Peace: "In only a few years' time, Saudi Arabia's soft strategy to combat extremism and terrorism [under the supervision of Prince Mohammed Bin Nayef] has generated some very promising results." According to the Washington-based Saudi American Public Relation Affairs Committee, SAPRAC, Prince Muhammad Bin Nayef's efficacious strategy in combatting terrorism made him a target for assassinations by terrorists. For more detailed efforts of Mohammad bin Nayef's initiatives, one can read this report. These efforts were applauded by President Barack Obama who stated "I can say that, on a personal level, my work and the U.S. government's work with Crown Prince bin Nayef, on counterterrorism issues has been absolutely critical not only to maintaining stability in the region but also protecting the American people". Further illustrated by the comments of the former Director General of the CIA Leon Panetta: "Mohammed bin Nayef plays an indispensable role protecting the kingdom founded by his grandfather. As intelligence chief, he decimated al-Qaeda in Saudi Arabia, penetrating plots, cracking down on funding and promoting deradicalization." The US, the UK, and Saudi Arabia are not perfect when it comes to many issues which still need improvement. I explained more in this article. Nevertheless, at least, they are taking concrete steps and donating millions of dollars to the fight against terrorism; For example, according to Muhammad bin Nayef and several other resources including the United Nations, "The Kingdom also provided resources to the United Nations' counter terrorism center, including funds of over $100 million". This demonstration can be an inspiration to other countries to join in this fight as well. Instead of making accusations or placing blame, Iran would be better served by demonstrating what it has offered to the fight against terrorism, such as the amount it has donated, what programs it may have in place, and any other concrete approaches Iran may have initiated. If there is to be any progress made to battle global terrorism, it has to be a multilateral and unified effort. The focus should be on the establishment of a new comprehensive, locally and internationally coordinated counter-terrorism strategy. Action is needed. Not after trivial vendettas have been settled, not after Iran has pointed a finger in every direction but at itself, but right this second. In my humble opinion, I believe the most comprehensive plan would be a one that concentrate on tacking the ideology of the terrorist groups, the poverty on global scale, the underdevelopments in many parts of the world, and application of affective social media. Alongside this multi-front strategy, "inter-faith and inter-cultural dialogue must guide efforts to eliminate incitement". Every nation and government can contribute to this instructive plan to overcome global terrorism by achieving unification of all forces. Dr. Majid Rafizadeh is an American political scientist, president of the International American Council on the Middle East, business advisor, and best-selling author. Harvard-educated, Rafizadeh serves on the advisory board of Harvard International Review. He is regularly quoted and invited to speak on national and international outlets including CNN, BBC World TV and Radio, ABC, Aljazeera English, Fox News, CTV, RT, CCTV America, Skynews, CTV, and France 24 International, to name a few. Dr. Rafizadeh is frequently invited to brief governmental and non-governmental organizations as well as speak, as a featured speaker, at security, business, diplomatic, and social events. He has been recipient of several fellowships and scholarships including from Oxford University, Annenberg, University of California Santa Barbara, Fulbright program, to name few. He analyses have appeared on academic and non-academic publications including New York Times International, Los Angeles Times, CNN, Farred zakaria GPS, The Atlantic, Foreign Policy, The Nation, The National. Aljazeera, The Daily Beast, The Nation, Jerusalem Post, The Economic Times, USA Today Yale Journal of International Affairs, Georgetown Journal of International Affairs, and Harvard International Review. He is a board member of several significant and influential international and governmental institutions, and he is native speaker of couple of languages including Persian, English, and Arabic. He also speaks Dari, and can converse in French, Hebrew. More at Harvard. You can sign up for Dr. Rafizadeh's newsletter for the latest news and analyses on HERE. You can also order his books on HERE. 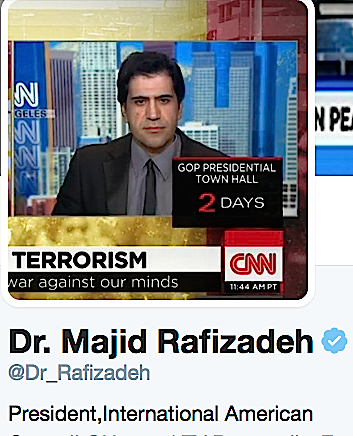 You can learn more about Dr. Rafizadeh on HERE.